Welcome to the new site for Entrepreneurial Ninja and Daryl Lu (one and always the same). As you can see, the site has been restructured quite a bit. In short, I migrated from Blogger to WordPress on the backend. The cost for WordPress is higher as I am now hosting the site through Siteground where prior, Blogger was self-hosted and free. Blogger was always a “good enough” blogging site. However, it lacked flexibility. This was apparent after working with WordPress for several companies. One of the primary areas I wanted greater flexibility was in formatting pages that were not blog posts. To this, you’ll see more updates come down the line starting with my My Story page. Then, I will redesign my homepage and so on. As my roles continue to flex and adapt (as any good Ninja does), my digital presence must also flex and adapt. WordPress will allow me this flexibility. All of this was spurred by the recent acquisition of the company I was building, Burner Rocket. I am unsure of what my long-term plans are. Building a new company from the ground-up is enticing. However, after 6 years of doing this with multiple companies, taking a break could provide some relief. Or, I can continue taking the plunge with another early-stage company. In any path I choose, I will have my personal mission to guide me – “to change the lives for the greater through entrepreneurial endeavors.” Whatever step that is, it will be a step. I’ll keep you in the loop of whatever that next step is. Till then, enjoy the new look and feel of Entrepreneurial Ninja. The other day, a real estate agent came by to look at my house. In my house, shoes come off and stay at the door. My real estate agent started taking off her shoes and noticed my extension collection of shoes. I use specific shoes to help me be at my best. My running shoes, for example, are just for running. I’ve used shoes for running and “everyday”, and found my feet to be cramped or hurting after long runs before. Then, my hiking shoes are also for when I go up north with my girlfriend during the winter months and there’s snow on the ground. These shoes are waterproof and have traction for the outdoor trails — very different outsole required vs. normal street. My bike shoes are strictly used in tandem with my pedals on my mountain bike. My soccer cleats are, of course, for soccer on natural ground. My turf soccer shoes have a different sole to accommodate the turf fields I typically play on for some soccer leagues. I’ve become a bit elitist in my shoes. It’s obviously an expensive way to live; though, each function-specific shoe lasts that much longer than having a general do-everything shoe. Sometimes, a general shoe just doesn’t work or could cause injury in a sport. I mention this story because I’ve noticed a similar trend in my nomadic work life. I’m the typical mobile worker. I am at Starbucks this morning. There’s no plug nearby, so I’ve decided not to use my Microsoft Surface Pro, yet. It only has a battery life of 4-5 hours now, and I plan to be here for a while this Saturday morning. I’m using my iPad (non-Pro), my alternative portable device, to write this post and hammer out emails. I love having this device as I can take digital notes vs. the written notebooks in the past which, as an archive, is hard to review. My iPad started out with 30% battery life. I noticed my phone only had 14% battery life. I plugged in my Anker external battery which has two USB ports — one for each of my iPad and my Galaxy S9. Now, my iPad is at 59% and my S9 is at 42%. My Surface Pro is my preferred mobile driver as it’s hugely powerful and can do everything I want for multi-tasking to my heart’s (and brain’s) desire. But I love using my iPad for very focused, specific applications. My S9 is a diversion with limited professional application when my other devices are unavailable. But at home, I also have a 2013 MacBook Pro. It’s very powerful as well. It’s hooked up to a 28” external monitor. It sits on a stand to elevate to eye level while Bluetooth Apple keyboard and trackpad give me added comfort. The other day, I had my Surface Pro connected to a 24” external monitor next to my MacBook workstation, and I had my iPad out to take notes. But for the most part when I’m home, I use my MacBook because it’s got everything set up for long-term comfort. Thanks to cloud apps, I can do just about everything seamlessly. I save a file on my Surface Pro in my Google Drive while at the coffee shop and leave the device in my bag at home. At home, I can access the file on my MacBook Pro to continue working. I took notes earlier on my Microsoft OneNote on my iPad, and I need to remember what that was, so I pull up OneNote on my MacBook, too. They’re synced together! I leave home for dinner. While waiting, a client writes me an email that I see on my Galaxy S9 via the Gmail app. I can retrieve the file I was working on via the Google Drive app. Oops, did I save the file on my Desktop and not on the Google Drive? No problem. I can access my MacBook Pro via remote desktop. I’ll just log in and drop the file into Google Drive now. Meanwhile, I need access to a team account that I don’t have the password for directly. My teammate’s out for dinner as well. But wait, I can log in still because I can use my LastPass account that has shared account details for the team. I can log in! Oh, and I still have a Samsung ATIV Book 9 Plus ultrabook laptop from 2012. But because it’s an ultrabook, its internal organs are slowing down these days. So, I don’t use it much. It’s still next to my workstation at home anyways. When it comes to having options, having flexibility, having the tools to do things better, costs can rise significantly. It makes us that much better than if we were to go the generalist route, doesn’t it? In this digital age, how much of that can I legitimately start cutting? I’ve added subscriptions to help keep my development code private. I am archiving more files in the Google cloud. Thus, I must continue paying for growing storage. I have services that keep my sites up and running like this one. Those costs will have to continue lest I give up sites and domains. Costs are only rising. When I decide to build my next company, my personal burn rate will be higher. Should I take on another role full-time before my next venture? Will I be more comfortable with the new lifestyle? Will my desire for “more” and “better” handcuff me to a new, higher-cost normal? This is what happens when I clear my head in the morning and ask the deeper questions. It gives me a chance to evaluate my direction. VLG’s investment in technology illustrates a commitment to providing mobile, digital, and direct mail services that address ABM challenges. 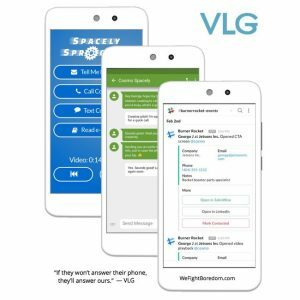 ADDISON, Texas, Oct. 25, 2018 /PRNewswire/ — VLG Marketing LLC (VLG) announces the acquisition of Atlanta startup Burner Rocket for an undisclosed amount. The Dallas-based digital marketing agency continues to increase the diversity of its proprietary technology offering that addresses shifts in business-to-business marketing strategies with the advent of account-based marketing (ABM) and account-based selling (ABS). I’ve been toying with a few ideas on the side these days. They’ve been all over the place including even speaking with Emory University’s Department of Technology Transfers. Hey, I’m an opportunist! I go after opportunities that I can bring to fruition and that sound exciting. I don’t always have experience in these areas. However, I’m betting on myself to figure it out as I go. One recent idea has been in the SMS chatbot world. Specifically, how managers organize teams in preparation for the next game. Typically, this is done via mass email threads or annoying group texts. Then, players delay and delay responding. Oftentimes, the emails are buried. Then, managers must find subs should not enough people say they can make the game. I immediately thought about using text messages as the delivery mechanism. SMS, specifically, might get faster responses minus the group messages (MMS). I’ve run into the problems of being a manager plenty of times in the past. I did not do the Mom Test. Instead, my friend and I just start digging into leveraging Twilio. The problem is not overly complicated. The problem isn’t a big world problem. I don’t know how well to monetize. All this tells me I should not pursue the idea. However, I’m pushing on. I’m pursuing this idea called TeamChatThing as a testbed to learn more about the SMS world and what’s available. What I like about SMS (short-messaging service, or text) is that aside from emails, phone, and face-to-face interactions, SMS is the next ubiquitous communication channel. SMS is something most people are so familiar with. There’s no need to push new users to download apps. Team management aspect is a test. I want to test people’s responses and response times. I want to test the complications of RSVP’ing – specific use case. I want to dig into what’s possible to automatically respond and record responses. Complexity builds as players, in this case, are connected to different teams. Understand which team the player is responding to is tough. It’s a fascinating problem. I’m eager to continue digging into what’s possible and the deeper challenges with SMS. 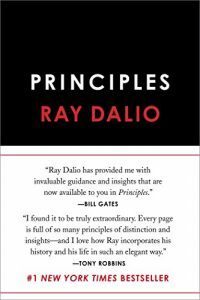 I received a gift of a book recently – Ray Dalio’s Principles. Funny, though, as my bud handed it to me realizing that it was a hefty book, and he knew how much I enjoyed audiobooks. However, I do love a good physical book so I can take notes on or re-read/ review. (Kindle e-books included.) Well, Jeremy, I listened to the e-book for this one, too. ?But are taking notes and reviewing the hardback you gifted. 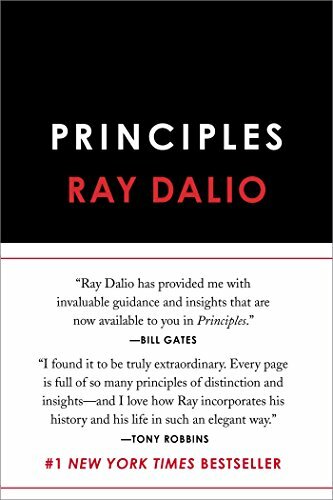 I enjoyed Ray’s book based on his leadership and the principles he instilled while leading his company Bridgewater from the ground to a 1,600+ behemoth in the financial world. What was inspiring to read, too, was how he initially co-founded the company but early on, had to let everyone go including his co-founder who left as not much money was coming in. Ray had to rebuild his team from just one (himself) to the company it is today. The book is can be broken up into a few parts – his and Bridgewater’s story before diving into the personal and business principles. There are hundreds of principles that grounds the company in its business dealings, and that enables it to continue to thrive. Like Patrick Lencioni in his book The Advantage, Ray finds personal assessments to be highly informative. Each assessment provides a view into the strengths and weaknesses of team members, which enables Ray’s team to build teams to deliver the best outcomes. He takes a lot of the personal and politics out of the equation and leans into data. Ray is a fan of leveraging artificial intelligence. Really, he’s a fan of blending both computer systems with human intelligence and interactions. He started building his forecasting and analytics systems from the start – continuously training it to perfect forecasting. He’s able to leverage opposing outcomes from either “system” to dive into what could be missing or inaccurate. Meanwhile, agreeing results from both systems gives high confidence of known outcomes. One of the biggest drivers of Ray and Bridgewater’s success is the idea of radical transparency. This means that personal assessments are completely out in the open so that team members understand how each other acts and works. Transparency enables teams to make mistakes, but own up to them so the rest of the team can learn and prevent future similar mistakes. Meritocracy over autocracy for Bridgewater. Here, all associates at Bridgewater has the ability to challenge authority as long as there is clear merit in the person and the process. This is also where Ray leans into his belief that credence should be given to those who have demonstrated success in at least three occasions of some task/ venture. I touched on this in one of my previous posts in how this affects how I feel in my own ability to coach. But thinking about this idea, Ray has also only had “one” entrepreneurial/ business success (with Bridgewater)… not three. ? There are many, many principles in the book (just as the title implies). It’s best not to try to adhere to all of the principles from the get go. Heck, it may not make sense to adopt any of the principles. It’s important realize whatever principles make sense (for me, you, whoever). However, it’s a constant practice to not only align myself to my principles, but also ensuring a company is aligned. And much like Bridgewater, if some principle should be rescinded or updated, it’s all possible as long as there is merit and transparency to the process.